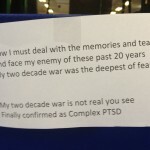 from an email received this morning from Alison Garner, a teacher at All Saints Catholic College Y9 pupils to whom I presented “My Two Decade War” presentation to last month. I am looking forward to receiving 165 letters from my teenage audience…. it is important for them to understand the world outside of their own. on 6th March I received an email from Alison Garner, a teacher whom I met in Sarajevo for the first time last Summer at a children’s riding camp in the mountains of Kakrinje where we were volunteering… here’s the gist.. 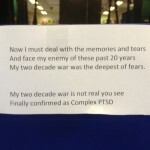 Although Alison was unaware, as I received the email I myself had been suffering acute symptoms of ptsd since early 2011 (some 16 months) and was just about to attend a Paradigm Change Programme at www.talking2minds.co.uk at a time when I felt there was no help for “someone like me” having ALMOST given in to my nightmares and flashbacks of almost 20 years of ineffective NHS treatment and having been told by Combat Stress that “you are too acute for us to take you”… I was taking the coward’s way out. Talking2minds support SAVED MY LIFE… no more no less. 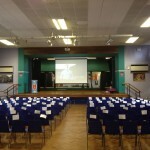 So, this invitation encouraged me to “speak out” about my illness to raise awareness… Here’s what happened… a 1 hour film presentation which I hope will provoke thought and response from every one of the kids who listened so attentively…. On the seat of each child was a small slip of paper that Alison had prepared… each bore the name of a child who lost their life in the siege of SREBRENICA, Bosnia Hercegovina. and said: “on each of your chairs is a slip of paper bearing the name of a child of your age who lost their life in Srebrenica, one of the worst genocides in modern history. Please take it, write your name on it, put it in your purse/wallet. Now you are connected. Please pray for the child with whom you are now connected, tonight and always”. The kids sat quickly… and in silence. 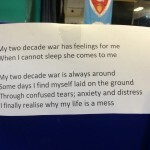 On the back of each chair in the assembly hall Alison had also stuck an extract of my first ever poem “My Two Decade War”. About my own personal battle with an illness I didn’t ask for, but am PROUD of the reason I have it. I bore witness to the horrors and atrocities of War in Sarajevo and have witnessed it’s aftermath for the past 18 years. A war that could have been stopped much sooner. 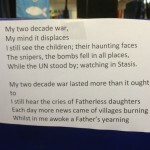 I make this post to raise awareness of the amazing work of talking2minds and ask you to consider donating to support them in saving the lives of those who didn’t die in our war. 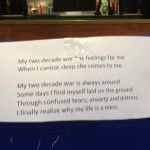 Yet we continue to fight our own war… our memories, memories created so that YOU can sleep safe at night. Much more needs to be done for my comrades, many whom, like me, suffer a disease like cancer, yet it doesn’t kill… until you kill yourself with the potential, for some, to harm others without the right help. 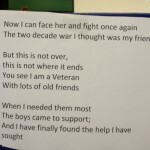 I also have a “closed” Facebook group, PHOENIX RISING, offering mutual support, healing and a channel for sufferers of ptsd to getting the right treatment… “Shift Happens” and “Together We are Stronger”. Look me up on Facebook or YouTube if you wish to join PHOENIX RISING or need help/support with ptsd. 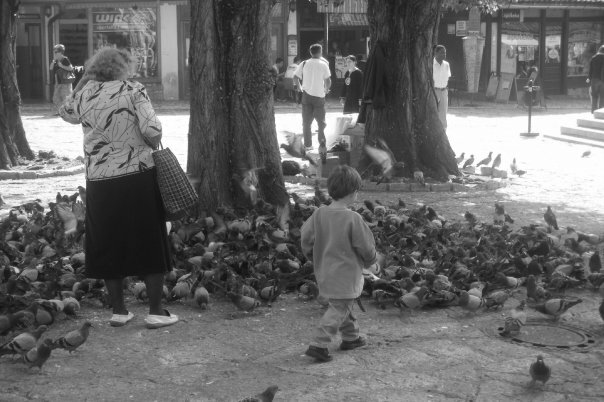 Times of my life… and my love for Hurmija, the Mujic Family, Sarajevo and Sarajevans. 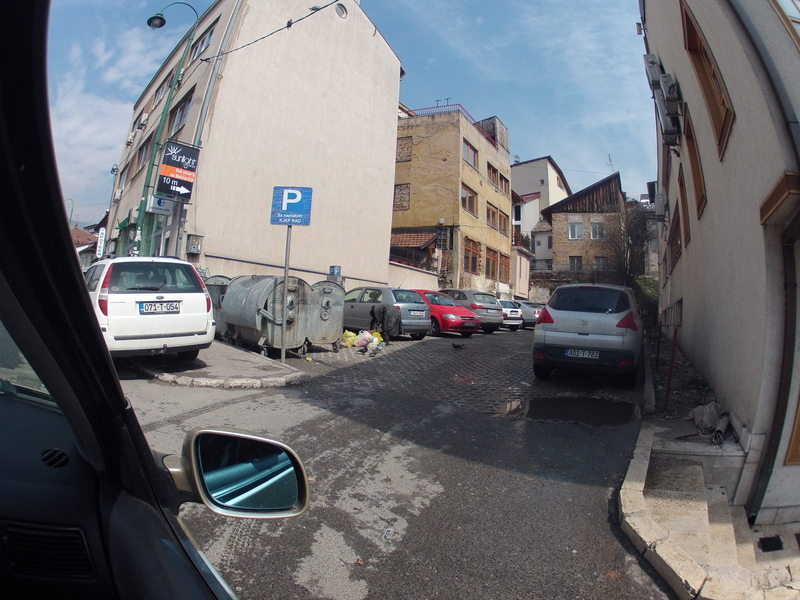 Bascarsija, Sarajevo… City of my Dreams. Mission Bosnia: KIDS’ Founder, Vic Ferguson meets the Body Shop Foundation with Bosnia Proposal. 1. As a result of our telephone conversation on 13 September 1996 Kids in Desperate Situations (KIDS) have prepared this brief for our meeting on 25 September 1996. I hope you will find it interesting. 2. The aim of this brief is twofold: to provide information on KIDS, and to give information on projects in Bosnia researched by KIDS which may be useful in the decision making process of Children on the Edge when considering a humanitarian project in Bosnia. a. 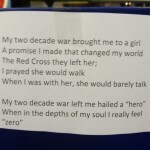 Available projects from The International Federation of Red Cross and Red Crescent Societies. These are just a few examples of possible options. b. 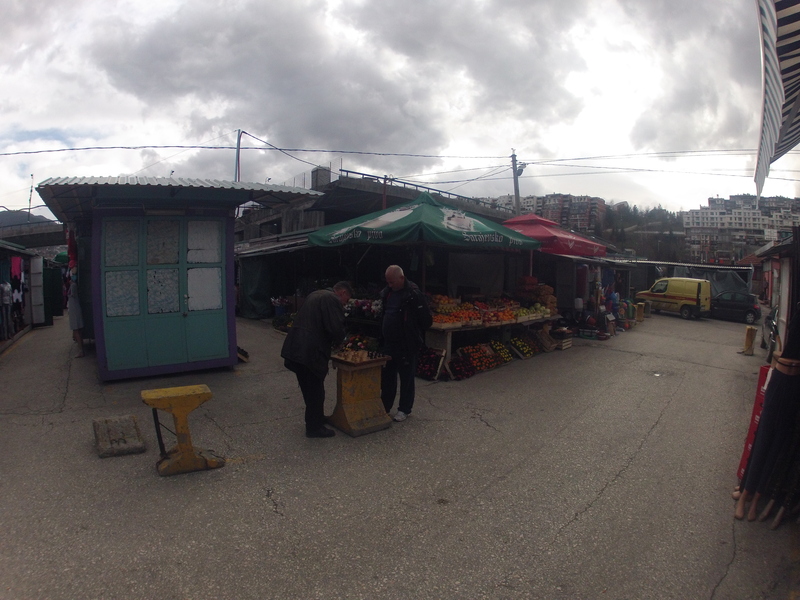 A snapshot of Sarajevo and KIDS projects. c. A small selection of press cuttings and articles. 1. Please find below information on the Non-Governmental Organisation, ‘Kids in Desperate Situations’(KIDS). 3. Background. 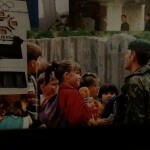 Whilst in Sarajevo on a six month operational tour which began on 22 November 1995 Staff Sergeant Ferguson met an 11 year old girl called Hurmija Mujic in Sarajevo’s Kosevo hospital. Hurmija had been paralysed by shell fragments embedded in her spine. She is from Srebrenica, which fell under tragic circumstances last summer. Her Father and two older brothers have been missing, presumed dead, since July 1995. By March 1996 sufficient funds had been raised, through public appeals and from the generosity of soldiers and their families, to fund the evacuation of Hurmija and her mother, twin sister (who was also injured) and their younger sister. Logistics were put in place also for the evacuation of three other families, from differing ethnic backgrounds, from Tuzla, East and West Mostar. KIDS was born out of this experience in May 1996, to carry on the work started by Staff Sergeant Ferguson in a more formal way and with broader horizons. 4. Mission Statement. Kids in Desperate Situations (KIDS) is a Sarajevo-based mission of local and international volunteers connected by their interest in helping children affected by war. These children have urgent medical, educational or material needs which remain unaddressed by the international community and are outside the sphere of local humanitarian activities. KIDS plans to tackle one major project at a time, while gathering information on others. This ensures that each project is completed in the shortest time possible, thereby promoting efficiency. 5. KIDS’ principle aim is to continue raising funds for, and giving assistance to, individual children whose lives can be saved by prompt medical evacuation. KIDS has carried on this work under the umbrella of Child Advocacy International (CAI), a UK Registered Charity (No 1048781), by giving direct support to the staff of CAI by funding travel, subsistence and treatment costs for children selected for consideration by KIDS and any other expenses involved in the evacuation and/or medical care for the selected children. Each case is considered by CAI staff and advice given on the benefit for the child might gain from evacuation. 6. In addition to medical evacuations KIDS undertakes such projects as repairing facilities for children, obtaining equipment for schools and orphanages, distributing clothing, toys and other materials. KIDS is also running projects to procure computers and educational equipment for international child-to-child E-mail communication. Together with gifts of material and educational aid these projects are implemented in schools and institutions which lie outside the usual aid circuits and are normally carried out using materials donated by members of the public. 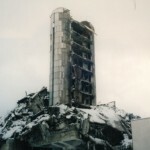 Hurmija and her family returned to their home in Sarajevo in July 1996. Whilst in UK Hurmija received a full assessment of her injuries but, unfortunately, an operation to help her walk unaided was not possible. However, she received extensive rehabilitation and can now walk with the aid of her gait orthosis. Both Hurmija and her family received psychiatric counseling and the girls all went to school whilst in the United Kingdom, and can now speak some English. Hurmija is at home full-time and can now move around the family apartment. She attends the same school as her sisters and now shares far more of their lives. A wonderful achievement after Hurmija spent almost 2 years in a hospital bed. The family live in a third floor apartment. KIDS is trying very hard to obtain ground floor accommodation in order that Hurmija can lead an even more normal life. KIDS staff in Sarajevo continue to visit Hurmija regularly and provide anything that she needs, including catheters and drugs. 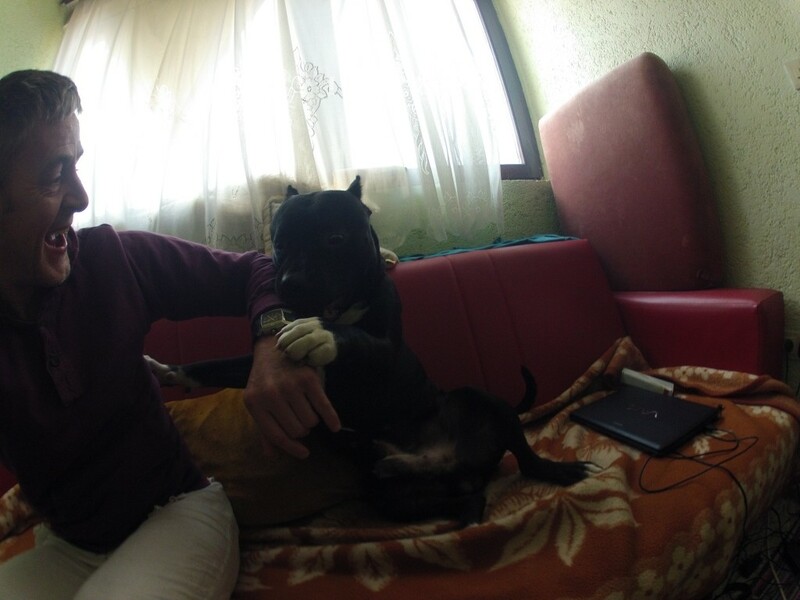 She receives regular physiotherapy from an Italian NGO based in Sarajevo. Of the other 3 children evacuated in March 1996, Elvis Kovacevic (age 14) and Adnan (Ado) Cosic (age 16 months), both had successful heart surgery and are fit, healthy and back in Bosnia. Unfortunately, Ivo Susac (age 7) from West Mostar proved incurable and returned home four weeks after the evacuation. The most recent evacuation was that of Medina Karic, a two year old girl from Zenica. Medina was suffering from congenital heart disease and would most certainly have died if left in Bosnia. She was evacuated to Priory Hospital in Birmingham on 27 August 1996. The operation (key-hole surgery of the heart, one of the first operations of this kind to have been performed on such a young child) was successful. Medina is now fully recovered and returned to Bosnia on 23 August 1996. 8. KIDS have also evaluated three other children who need evacuation. 5 year old Suada Hukic who has congenital heart disease, 12 year old Amela Cengic who has severe scoliosis and 12 year old Ajsa Softic who also has a heart condition. The medical examination reports show that each of these children need life-saving treatment urgently. 9. KIDS continues to support schools and kindergartens, orphanages, institutes for the blind, mental and physically handicapped in Bosnia and Croatia with material aid, food, educational supplies and computers. KIDS is also trying to help set up a paraplegic basketball team in Sarajevo, an effort which will require equipment, specialized wheelchairs, sports strip, balls, and nets. 10. You can see from the above information that we have achieved an awful lot to help these children over the last 9 months. The range of activities is diverse, but KIDS staff see a need, and we try to help wherever we can. This is an initial description of the situation we have identified in Sarajevo institutions regarding child care. 1) There are no intensive care units for children in Bosnia and Herzegovina. Before the war, all children requiring intensive care were immediately referred to Belgrade. Today, child victims of such accidents as landmine explosions and traffic incidents can only be referred to Zagreb, where their parents have to bear all costs. Those children whose parents cannot pay risk death or permanent disabilities, having no choice but to stay in Bosnia and Herzegovina and rely on whatever inadequate care possibilities exist. 2) No facilities exist in Bosnia and Herzegovina for the treatment of cancer in children. 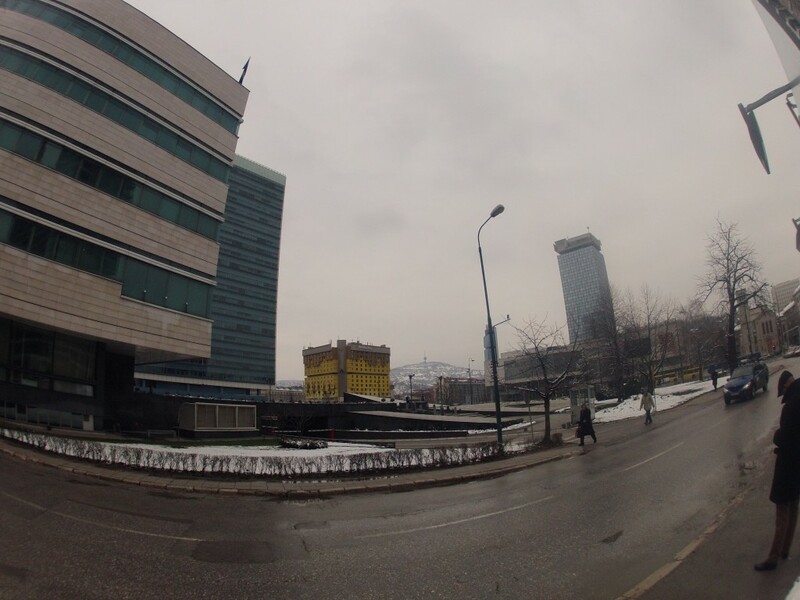 Patients are, again, referred to Zagreb, at their own expense. 3) All infants weighing less than a kilogram at birth die due to a lack of incubators. 4) The orthopaedic and paraplegic units at Kosevo hospital are extremely short of equipment, have only limited therapeutic facilities, and virtually none for children. 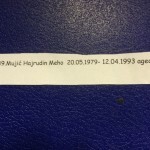 This became clear already when we started working with the case of Hurmija Mujic. Sarajevo’s schools for the care of physically and mentally handicapped children (the schools for visual and auditory handicap, and the school of defectology) have now come under the auspices of the Irish Refugee Trust and additional organisations. All now have supplies, equipment, teacher funding and training schemes, and are undergoing renovation. Sarajevo has 2 of these, the Dom Bjelave Home, and the Catholic Convent home. The first is under the umbrella of Colonel Mark Cook’s organisation (Hope and Homes for Children). The convent is raising funds, but no children are currently living there (the government has fears that they will be indoctrinated). You can probably tell from the trend of this report that we are very much in favour of supporting children’s facilities at the hospital. Perhaps we are slightly biased by the amount of evidence we see of the hospital’s needs when we are evacuating children, but the ICRC report will establish where there is a genuine need for supporting children’s homes outside Sarajevo. A further note: during the evacuation of children we encounter many cases of clear-cut need in their families (there tends to be some ratio of parent poverty to the acute health problems of the children. We are very much in favour of a fluid “poor fund” which we could administrate at an individual, personal level. 1. The staff of KIDS have built up relationships and contacts in many areas. Some of these could help as follows should Children on the Edge undertake a humanitarian aid project in Bosnia. a. KIDS/CAI. Strong links are already established with Child Advocacy International (CAI), a UK Registered charity with extensive experience throughout Bosnia. Their advice may be invaluable in any chosen area of humanitarian work. (1) A small office with a local area telephone (can receive incoming international calls). Computing facilities with e-mail (international). The office may also be used for sleeping in! (2) KIDS have the use of a Landrover based in Sarajevo which may be useful until logistic support is established. (1) Armin Alagic. 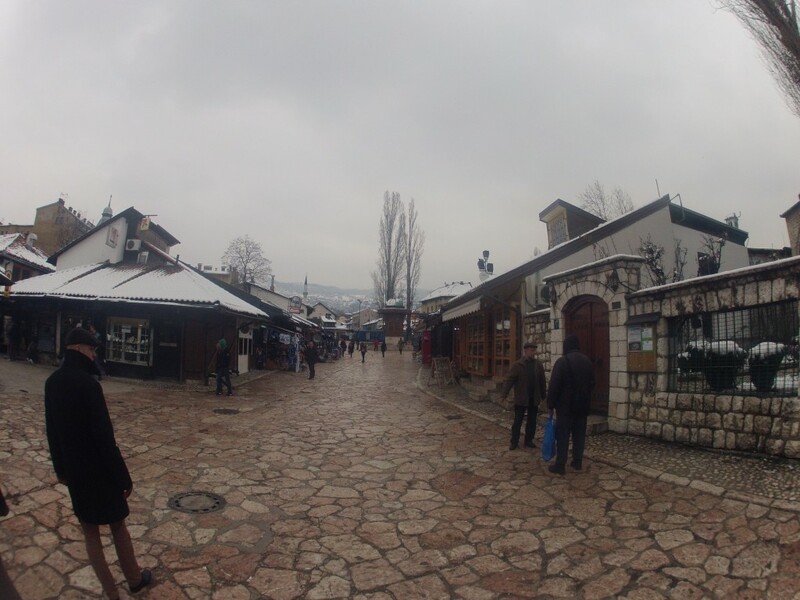 A Bosnian national who speaks English, has extensive knowledge of the Sarajevo area and has worked throughout Bosnia during medical evacuations. Armin has invaluable local contacts from the war period. He can speak English and can interpret. (2) Marina Bowder. An English national who is currently employed by the International Organisation for Migration (IOM). Marina has an honours degree from Trinity College, Cambridge and has 14 years experience of volunteer work with the elderly, terminally ill, drug addicts, homeless, refugees, the blind and children throughout Bosnia. She speaks fairly fluent Bosnian. 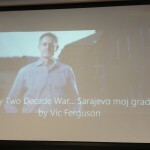 (a) Vic worked in the Coalition Press Information Centre in Sarajevo. The worlds’ press receive briefings daily at 1100 A.M. It would be possible, if required, to use these facilities with a ‘ready made’ international press audience cost-free. (b) A mine awareness package is available which is strongly recommended to anyone entering Bosnia. 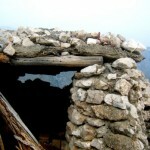 It would also be possible to organise a specialist military mines awareness lecture in Sarajevo. (c) Vic has some close contacts in the international press in Sarajevo which may be useful. (d) Phil Ball, an excellent Navy Public Information photographer with extensive experience in Bosnia, returns to Bosnia in January 1997. He is willing to help wherever he can. (e) It is possible to obtain unclassified military map coverage of any area of Bosnia with a ‘mine threat assessment’. (f) Because Vic is a soldier himself he has been able to tap a vast reservoir of good will not only in the British Army but among NATO forces in general. After is efforts with Hurmija were publicised hundreds of soldiers and members of the public responded with offers of money, fund-raising events and physical help reaching from the United Kingdom and Europe as far as Cyprus, America and Japan. Because of KIDS’ military links Vic has been able to utilize, (from individual good will), NATO aircraft, vehicles, manpower and other logistical support. (g) Fund-raising connections in Europe and America. 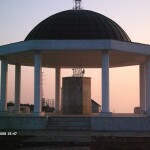 Donors include Lions’ Clubs International and the World Memorial Fund. (h) An established network of other organisations and local contacts. 2. While the above points are not exhaustive they outline some of the possibilities. First multi party elections in the six republics of the former republic of Yugoslavia. Serbian Communist Party leader Slobodan Milosevic is elected Serbian President. June: Slovenia and Croatia declare independence. Yugoslav army attacks Slovenia. (Sixty killed in one week war). July: Yugoslav army withdraws from Slovenia. Serb-Croat skirmishes going on since early 1991 escalate into war between Croats and rebel Serbs, backed by the Yugoslav army. September: UN imposes arms embargo on all former Yugoslavia. December: EC, under pressure from Germany, says it will recognize Croatia and Slovenia. January: UN mediator, Cyrus Vance negotiates a cease-fire for Croatia. February: UN Security Council sends 14,000 peacekeeping troops to Croatia. BH declares independence. Bosnian Serbs proclaim a separate state, fighting spreads. 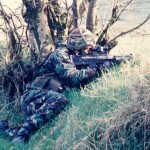 April: Bosnian Serb gunners begin the siege of Sarajevo. EC followed by the USA recognise Bosnia. 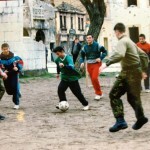 Intense fighting in Bosnia. May: Yugoslav army relinquishes command of its estimated 100,000 troops in Bosnia, effectively creating a Bosnian Serb army. UN imposes sanctions on a new smaller Yugoslavia made up of Serbia, and Montenegro for fomenting war in Bosnia and Croatia. July: International airlift begins to Sarajevo. September: UN Security Council drops Yugoslavia from the General Assembly. January: International mediators Cyrus Vance and Lord Owen unveil plan to divide Bosnia into 10 provinces, mostly along ethnic lines. February: Security Council sets up war crimes tribunal for the Former Yugoslavia. March: Bosnian Croats and Muslims begin fighting over the 30% of Bosnia not seized by Bosnian Serbs. April: NATO jets begin to enforce UN ban on aircraft flights over Bosnia. April/May: Security Council declares six “Safe Areas” for Bosnian Muslims. Sarajevo, Tuzla, Bihac, Srebrenica, Zepa and Gorazde. May: In a referendum, Bosnian Serbs overwhelmingly reject Vance/Owen plan in favour of independent Bosnian state. July: Warring sides reach preliminary agreement in Geneva on Union of Republics of Bosnia and Herzegovina with three states and three peoples. Bosnian President Alija Izetbegovic walks out in August after Serbs violate cease-fire. December: Early preliminary elections in Serbia, called by Milosevic, leave his socialists as the largest party. February: Mortar shells slam into downtown marketplace in Sarajevo killing more than 60 people and wounding about 200 others. NATO gives Bosnian Serbs 10 days to withdraw guns from Sarajevo region or face airstrikes. Bosnian Serb leader Radovan Karadzic agrees to move guns from around Sarajevo if soldiers from Russia, a historical Serb Ally, join the peacekeeping mission. US jets flying for NATO down four Bosnian Serb warplanes violating the “no fly zone”. March: Bosnia’s Muslim led government and Bosnian Croats sign US brokered accord ending year long war. May: Five Nation Contact Group peace plan. July: Serbs refuse Contact Group peace plan. August: Milosevic cuts ties to Bosnian Serbs for rejecting the plan. October: Bosnian government forces score their biggest victory of the war around Bihac, a fierce Serb counter-attack follows. November: NATO launches its largest action ever, about 50 jets and support planes attacking Serb airfield but failed to take out Serb jets attacking Bihac. Serbs detain 55 Canadian peacekeepers against further airstrikes. Eventually more than 400 peacekeepers held. NATO attempts airstrike on Serb positions in Bihac but the mission was called off when the UN fails to pinpoint targets. December: Former US president, Jimmy Carter, ends mediation mission with the announcement of a Bosnian Cease-fire. January: Four month nation wide truce takes effect. 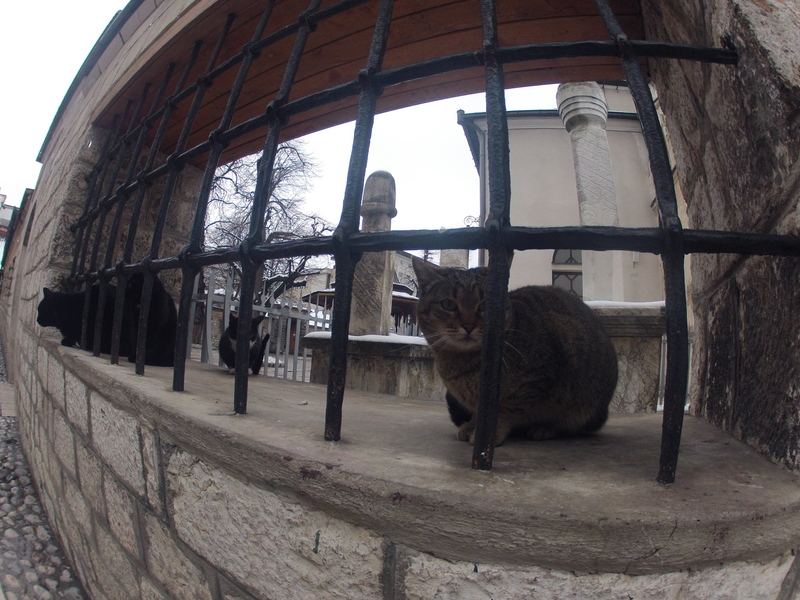 Bihac is never quiet. April: (8th) US aid plane hit by gunfire. All UN aid flights to Sarajevo cancelled. May: Bosnian cease-fire expires. Croatia launches blitz to recapture a chink of land from rebel Serbs. Serbs retaliate by rocketing Zagreb, six killed, nearly 200 wounded. UN orders Serbs to return heavy weapons to UN control and remove all heavy weapons to UN control and remove all heavy weapons around Sarajevo. Serbs ignore UN order. 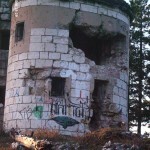 NATO attacks Serb ammunition depot. Serbs respond by shelling “safe areas” including Tuzla, where 71 people are killed and over 150 injured. NATO war planes attack more ammunition depots. Serbs take UN peacekeepers hostage. Eventually more than 370 are seized. Bosnian Foreign minister is shot down by rebel Serbs near Bihac. 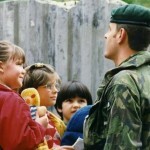 France, Britain and the United States sends thousands more troops toward Bosnia. June: (2nd) Serbs shoot down US F 16 over northern Bosnia. 121 UN hostages were released. NATO defence chiefs meeting in Paris, agree on Rapid Reaction Force to bolster UN peacekeepers in Bosnia. US envoy Robert Frasure fails to agree after weeks of talks with Milosevic on Serbia recognising Bosnia. Serbs release another 111 more hostages. US marines rescue downed F 16 pilot NATO approves new Rapid Reaction Force, but say peacekeepers will leave Bosnia by Autumn if rebel Serbs don’t accept new force. Complex evacuation plan approved. All but the last 26 UN hostages released. Government launches offensive to break the siege of Sarajevo. 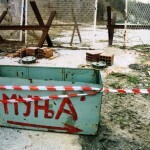 Serbs step up shelling of Sarajevo and other safe areas. July: Serbs overrun Srebrenica “safe area” after last minute airstrikes fail to stop the advance. Serbs deport Muslims from enclave. Serbs attack Zepa. August (30th): NATO air strikes hit Serb artillery positions. 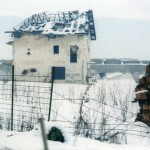 October (12th): Cease-fire throughout Bosnia. November (21st): Dayton Peace Agreement initialled, war ends in Bosnia. Minor skirmishing continues throughout Bosnia. The NATO peace implementation force ordered into Bosnia, winter deployment takes place (60,000 troops). 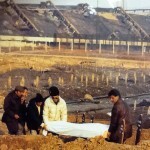 December (8th): London conference on reconstruction in Bosnia. (14th): Peace Agreement signed in Paris. April (18th): General demobilization of troops from the warring factions. June (30th): Elections in Mostar. UN Security Council sends 14,000 peacekeeping troops to Croatia. BH declares independence. Bosnian Serbs proclaim a separate state, fighting spreads.